CMC Rescue 430203 Rope Bags Model #2 - 1750 ci (29 L) Red by CMC at Wildly World. MPN: 430203. Hurry! Limited time offer. Offer valid only while supplies last. IMPROVED! Solid performers for years, our popular Rope Bags have been enhanced with innovative features for even greater convenience and ease of use. IMPROVED! Solid performers for years, our popular Rope Bags have been enhanced with innovative features for even greater convenience and ease of use. New contoured backpack-style shoulder straps were redesigned to offer greater comfort when carrying heavy loads. Bag tops incorporate a rugged rip-stop nylon for easy closure. Grab handles secured inside the top can be used to hold the bag open for quicker stuffing or to carry the bag from the top, haul-bag style. A sturdy side carry handle has been relocated for improved balance and includes gear loop attachments. The bottom of the bag features our new reach-in pouch that enables easy access so that even a knotted rope end can be deployed from either side, while remaining secure when transporting. Sewn web loops are attached at the base to enable tying the rope end off internally or externally. 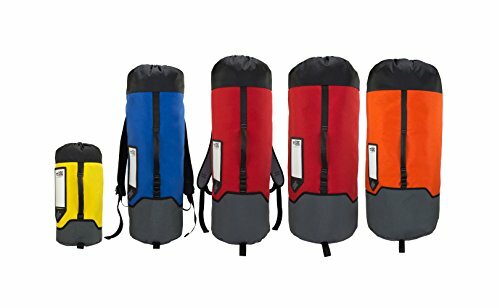 Reach-in bottom allows bag to be used easily from both ends Contoured backpack-style shoulder straps with integrated handle Clear-view sleeve for rope I.D. / log information Side carry handle allows for easy loading/unloading from apparatus Exterior gear loops for attaching carabiners Constructed from extra long-life 1,000-denier CORDURA® nylon Made in USA Working-At-Height / Industrial Rope Access / Technical Rope Rescue Working at height requires reliable, quality equipment. The Rope Bags can be used with confidence in work-at-height maneuvers for industrial rope access or technical rope rescue when used in accordance with the regulatory safety standards they fall under. Always use life safety equipment and gear according to the regulatory safety standards for which it is classified and/or certified.